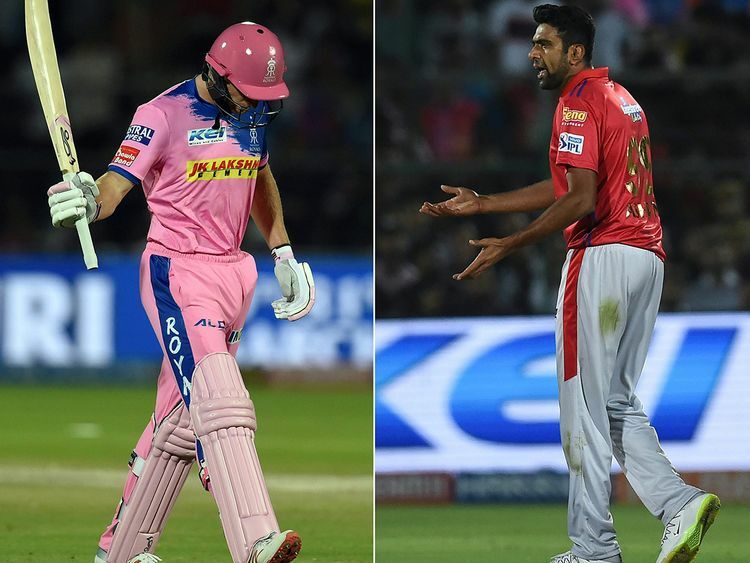 Dubai: The debate is on as to whether Kings XI Punjab skipper Ravichandran Ashwin’s decision to ‘Mankad’ Rajasthan Royals batsman Jos Buttler in Jaipur on Monday was right or wrong. Ashwin, well-known for his shrewd knowledge, rules of the game and the coaching techniques — given he runs his own cricket academy — used a grey area in the Laws of Cricket to dismiss Buttler. As per the Law 23 (3), Ashwin was within his rights to do what he did against Buttler as the ball is in play from the moment he starts his run up and hence a batsman is supposed to have at least his bat inside the bowling crease at the moment of delivery. However, there is a general reluctance among bowlers to exercise this right because such a dismissal would be regarded as unsporting. Attempting to steal a run during a bowler’s run up constitutes ‘unfair play’ — Law 42 (12). So if a bowler feels that the non-striker is backing up too far, the bowler can remove the bail. Ashwin did this when Butler — on 69 — was steering Rajasthan smoothly towards their target. Rajasthan needed 77 runs from 41 balls. The debate is whether Ashwin or any bowler would have sacrificed a winning chance by not using the law. Incidentally, Buttler was run out backing up too far against Sri Lanka in 2014 after two warnings by Sachithra Senanayake. Ashwin has also run out Sri Lanka’s Lahiru Thirimanne for backing up too much, but the then India skipper Virender Sehwag withdrew the appeal. The question for the future is should this law now be altered to avoid such situations? In the 1987 World Cup match between Pakistan and West Indies, Courtney Walsh refused to run Salim Jaffar out. West Indies lost the game to Pakistan but Walsh’s act is termed as one of cricket’s most sporting acts.